Following up on their moderately successful EP Dreamworld (2012) is Sweden's Mad Architect with Journey to Madness, their first long player. To be fair, we must note that this album contains all three songs from that EP: Dreamworld, Strange Machine, and Altered States as a CD bonus track. Like its predecessor, Journey to Madness finds founder and guitarist Magnus Daun, drummer Sven Lindsten, and vocal Snowy Shaw going after similar themes. Both in music and lyrics, there's a darker, heavier, feel to the album. It's definitely melodic and heavy power metal, but almost with Candlemass doom vibe going on. Some of this comes from deep, almost brooding, rhythm section even while it can gallop along at the same. You catch some of this within Dreamworld and Universal Law. Other times the feeling comes from the synth layer creating a lush, yet foreboding, atmosphere as found in a dark, damp, eerie castle. Then there's Shaw' vocal performance. He sways back and forth between singing in a clean metal style and to doing this low creepy growl, one step away from death vocals. Often this is done in contrast to voice to different characters in a song as within Mad Architect. In the end, Journey to Madness is a rather interesting and entertaining listen, thanks to the swerves between melodic, power, heavy, some gothic, and even some possible progressive, metal. I'm sure it's not the last we'll hear from Mad Architect. Recommended. 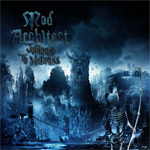 Journey to Madness is a rather interesting and entertaining listen, thanks to the swerves between melodic, power, heavy, some gothic, and even some possible progressive, metal.